There was an eerie sense, attending the emergency Extraordinary Session of the IOC in a Lausanne suburb, that we were perhaps witnessing the beginning of the end of the IOC, in the format familiar for most of the past century. Or we ought to have been. The hundred-odd Members – less a dozen excused on other business – had been summoned to ratify an Executive Board proposal to elect simultaneously at the annual Session at Lima, Peru in September, two host city candidates (the only two, both bidding for 2024), as an opportunist brace for 2024 and 2028. This they did unanimously – following presentation by Vice-President John Coates – after a debate thrown open to the floor and lasting barely 20 minutes. The cost of this exercise, assembling an administrative parliament from around the globe, constitutionally necessary but surely avoidable, could have helped fund, say, the rebuilding of a hospital in ravaged Mosul. This procedural manoeuver, the outcome of which was predictable weeks beforehand, could have been conducted, say, by postal vote? I am not writing flippantly. The IOC is one of the most benevolent institutions of our time, and evident since Pierre de Coubertin’s foundation: operating mankind’s most successful and enduring social gathering, propagating moral goodwill and harmony, every two years. There are cheats, we know: the marathon winner in 1900 is reckoned to have taken a short cut, but that’s life. 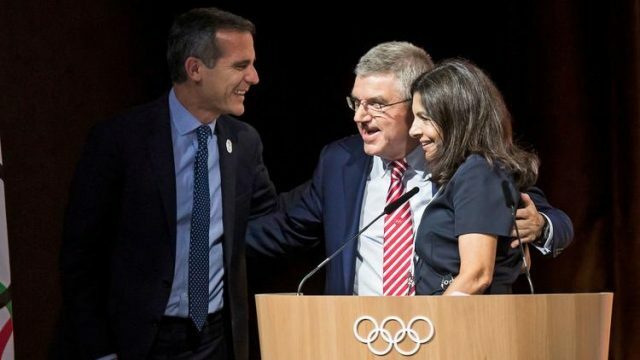 Now, in the 21st century, led by a busy, forthright German lawyer Thomas Bach, the IOC is attempting to modernize and rationalize the mountainous administration and expenditure incurred by any host city. It would be relevant to apply this principle back at base camp. The composition of the IOC sizably escalated during the presidency of Juan Antonio Samaranch, seeking continentally to democratize the self-elected club. Yet the contemporary complexity of the Olympic Games – with hundreds of events and thousands of competitors, inevitably necessitating appointment of qualified professional staff, which, in collaboration with the EB, is itself dominated by the President and embracing industrial scale technology and planning – leaves many rank and file IOC Members redundant. And they mostly know it. This trend was apparent during Wednesday’s debate, lack of input arising from the floor: what, for instance, might either city contribute by extending the scope for a Refugee Team? What we got were quips about Paris speaking English for the first time in four bids over thirty years. To contemplate the IOC reducing its numbers metaphorically expects turkeys to vote for Christmas, yet the justification is there. Certainly, the IOC is already benevolent, donating over three million dollars a day (90 per cent of income) back into Olympic sport, but in the long term its internal costing is vulnerable – leaving aside a current multi-million HQ redevelopment. For instance, there are 32 administrative ‘commissions’, from Legal, Financial, Marketing, Ethics, through to Heritage and Legacy commissions. Each of the latter too have over 25 members. In all, excluding professional staff, there are nearly 500 commission positions, many Members having several. If each Commission met even only once a year, the attendants’ air fares could build a smart gymnasium. Apart from which, as already suggested, the bulk of decisions are effectively devolved by the ‘government’, the EB. The Members, the ‘parliament’, are a socially prestigious, egalitarian, outdated, expensive… rubber stamp. Bach has much on his plate: probably too much to contemplate such radical constitutional reform, over the top of his existing Agenda 2020. Thirty years ago, Samaranch wanted the EB to elect host cities – like FIFA’s executive for the World Cup – but knew he could not swing it. The IOC is a unique, ideological institution trapped in an unforgiving commercial era.